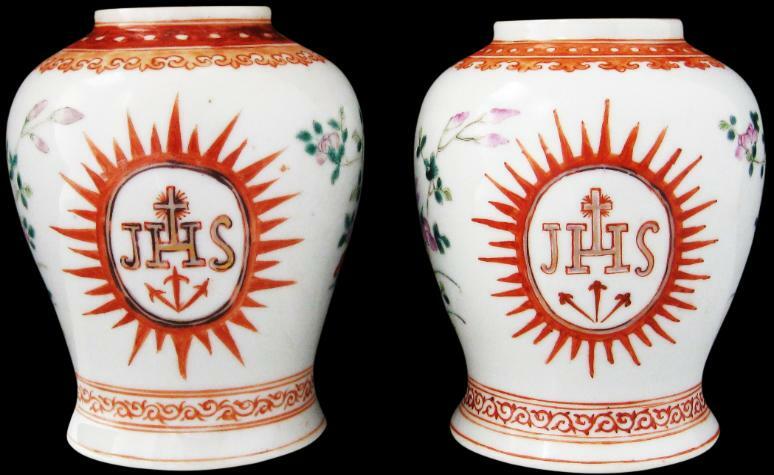 Both these baluster vases, in white porcelain, are decorated with the Jesuit monogram which incorporates the IHS Christogram in gilt and outlined in black and orange-red enamel, with three nails surrounded by a stylised crown of thorns in black, gold leaf and orange-red enamel. 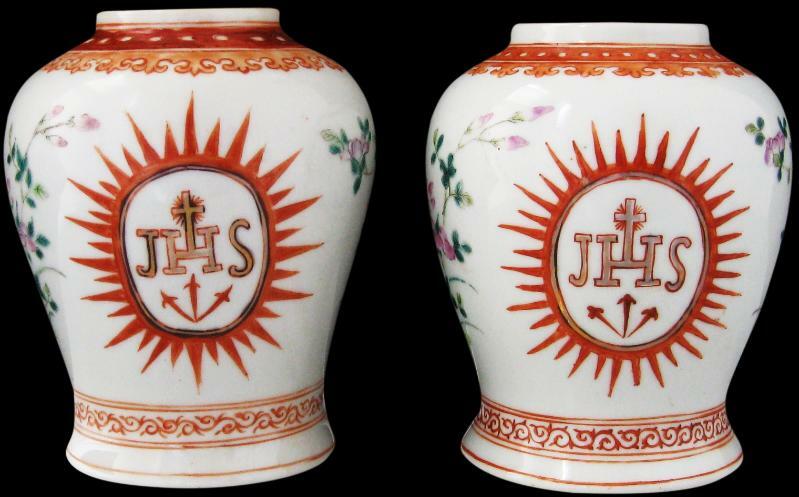 The monogram appears on both sides of each vase. 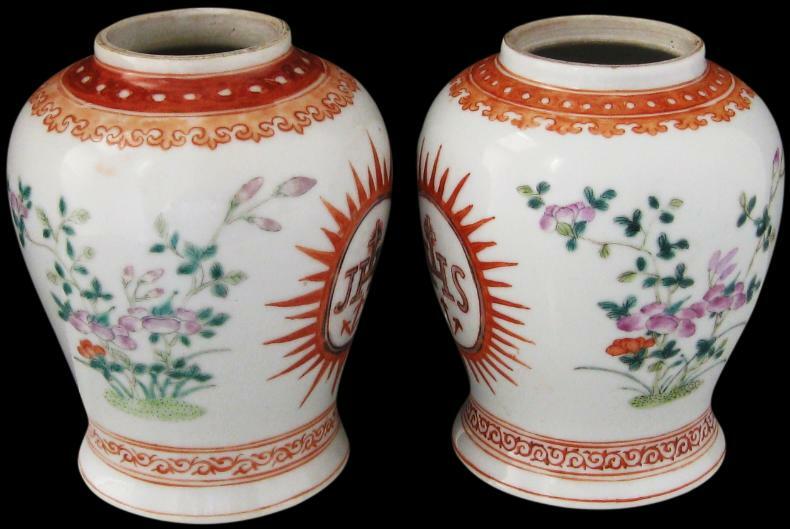 Floral sprays in polychrome decorate the vases between the monograms. 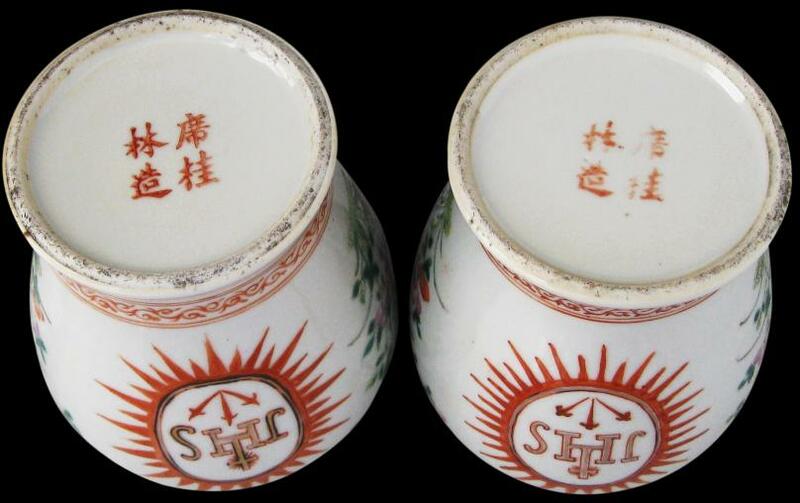 Both vases are marked to the base with the Chinese characters ‘Xi Gui Lin Zhao’ in orange-red enamel. This appears to be a factory mark – the character ‘Zhao’ means ‘made’ or ‘make.’ The remaining characters perhaps refer to a place name. The Christogram ‘IHS’ denotes the three letters of the Greek name of Jesus, iota-eta-sigma. The Greek letter iota is represented by I, and eta by H, while sigma is either in its lunate form, represented by C by S. Because the Latin-alphabet letters I and J were not distinguished until the seventeenth century, ‘JHS’ is equivalent to ‘IHS’, ‘JHS’ being the rendering that has been used on these baluster vases. Both vases are in excellent condition. There are no chips, cracks or repairs. 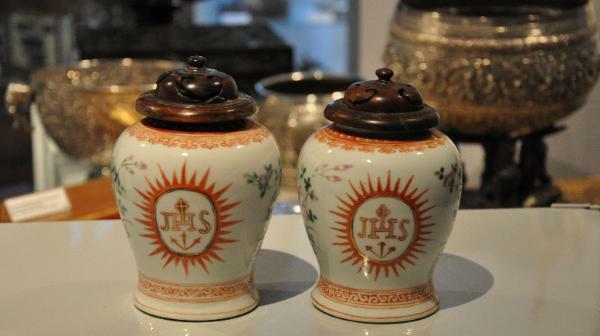 Vases of similar form and with similar Jesuit monograms and which date to the second half of the nineteenth century can be found in the Museu de Macau, Lisbon. Examples from that collection are illustrated in de Castro (2007). A vase of similar proportions and with a similar Jesuit IHS symbol appeared in Christie’s London, ‘The China Trade Sale’, April 5, 2000 (lot 80). 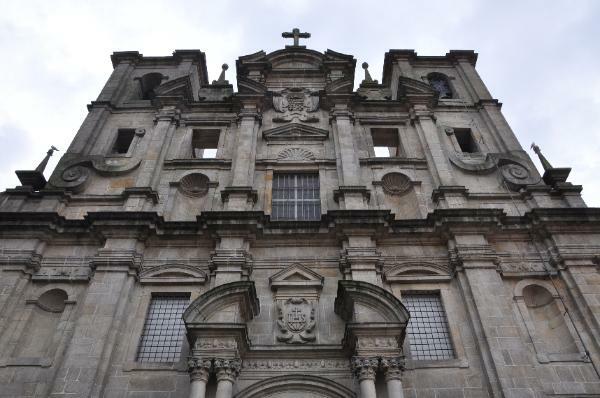 The Jesuits played a crucially important role in European advances into Asia. The discovery by the Portuguese of a sea route to Asia and the east allowed the Company (or Society) of Jesus, founded by Ignatius Loyola in 1534 for the proselytising of Christianity and the conversion of non-Christians, to greatly extend their reach. Spanish-born Francis Xavier was perhaps the most famous Jesuit Fathers. He travelled to Africa, India, Malacca, Eastern Indonesia, Japan and China to spread Christianity and to galvanise the small communities of Christians already in place in those locations. Fifty years later another Jesuit missionary, the Italian Matteo Ricci, made astonishing inroads into China by being invited to the Court of the Emperor Wan Li who was interested in Ricci’s knowledge of mathematics and astronomy. 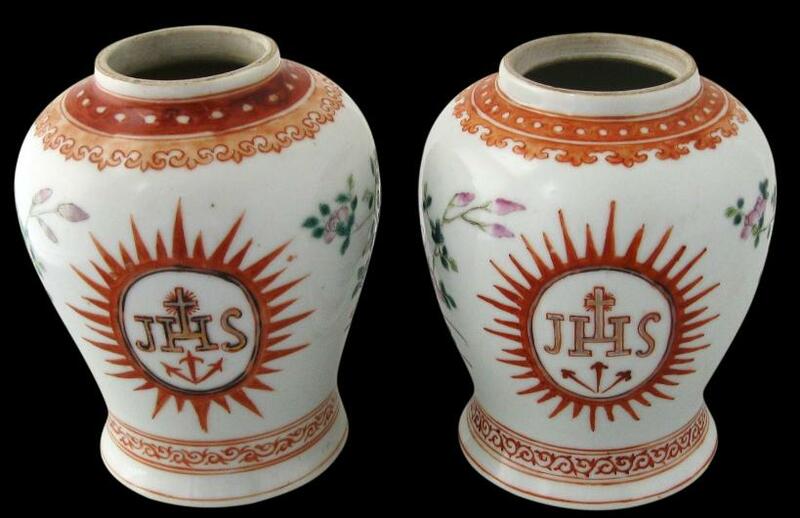 The Jesuits who established missionary activities, churches and schools in the Spanish and Portuguese colonies around the world, from South America to Goa in India to Macau in China and the Philippines, ordered from China a variety of porcelain items featuring Jesuit themes and symbols for use in their churches and missions. No Chinese porcelain decorated with religious subjects is known before the seventeenth century. 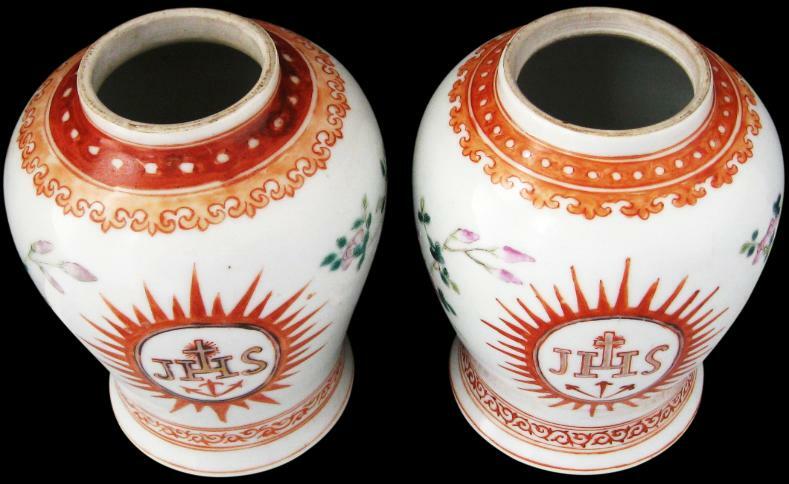 Items from the seventeenth century are very rare but typically appear to have been commissioned by the Jesuits. Religious porcelain became more common in the eighteenth century. de Castro, N., Chinese Porcelain at the Time of the Empire: Portugal/Brasil, ACD Editores, 2007; and Beurdeley, M., Porcelain of the East India Companies, Barrie and Rockliff, 1962. 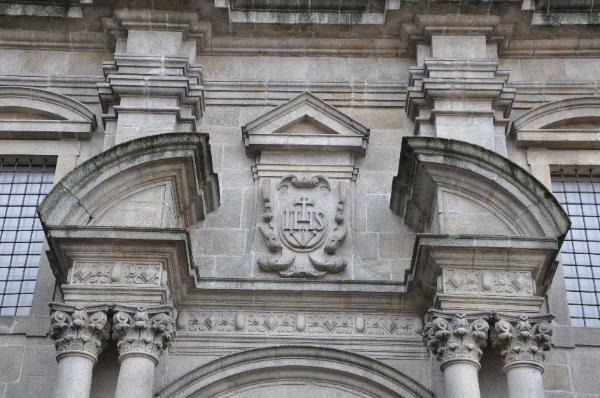 The facade of the sixteenth century Jesuit church, the Igreja dos Grilos, Oporto, Portugal, showing the initials ‘IHS’.